Vern Cotter is a New Zealander who currently coaches Clermont Auvergne in France's Top 14 but will take charge of Scotland in 2014. Cotter spent 10 years playing for Auckland in New Zealand before representing a number of clubs in France. He returned to New Zealand in 1999 to begin his coaching career, which started at Bay of Plenty before moving to the Canterbury Crusaders as assistant coach until 2006. He took over at Clermont for the 2006-07 season and in his first season the lost in the Top 14 final to Stade Francais but claimed the European Challenge Cup crown. The following season they made the Top 14 final again only to lose to Toulouse and a third successive final defeat came at the end of the next campaign at the hands of Perpignan. But Cotter's Clermont finally secured the Bouclier de Brennus with a 19-6 victory over Perpignan in the 2010 finale. 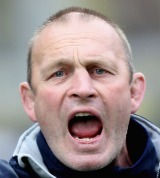 Cotter also steered his side to the 2013 Heineken Cup final only to see them beaten by French rivals Toulon. Later that season it was confirmed that he would make a high-profile switch to Scotland at the end 2013-14 campaign.